Stock futures indicate a higher open Wednesday, a day after eurozone contagion fears spurred a steep selloff and as U.S. inflationary pressure remains subdued. NEW YORK ( TheStreet) -- Stock futures pointed to a higher open Wednesday, suggesting a rebound from the previous session's steep selloff on eurozone contagion fears as the U.K. extended its support to Ireland and U.S. consumer price data suggests subdued inflation. Futures for the Dow Jones Industrial Average were up by 29 points, or 21 points above fair value, at 11,013. Futures for the S&P 500 were 5 points higher, or 3 point above fair value, at 1179, and Nasdaq futures were up by 9 points, or 9 points above fair value. If you can't see this chart, your browser doesn't understand IFRAME. However, we'll still&amp;amp;lt;A HREF="http://www.thestreet.idmanagedsolutions.com/charts/common/quote.chart?SYMBOL_US=SPX &amp;amp;amp;TIME_SPAN=6M&amp;amp;amp;XAXIS_LABEL=1&amp;amp;amp;WIDTH=290&amp;amp;amp;HEIGHT=145" target="0"&amp;amp;gt;link&amp;amp;lt;/A&amp;amp;gt;you to the chart. Stocks sold off sharply Tuesday, erasing all of November's gains to date on uncertainty regarding bailout plans for Ireland and other debt-logged eurozone countries. Global stocks were mixed as investors appeared hesitant to take on risk amid continued eurozone uncertainty and an expected interest rate hike in China. Hong Kong's Hang Seng shed 2% while Japan's Nikkei added 0.2%. The FTSE in London was down 0.2% while the DAX in Frankfurt was ahead by 0.3%. The U.K., while part of the European Union but not part of the eurozone, offered its support to Ireland as EU officials put together a bailout plan designed to stabilize Irish banks and keep weakness from spreading to other ailing eurozone economies. Ireland, however, has refrained from asking for help because it believes it will be able to support itself through budget cuts and tax hikes. The country also doesn't want to cede control of its finances to the EU and the International Monetary Fund. In U.S. economic news, the volume of mortgage loan applications fell 14.4% and refinancing dropped to the lowest level since July, down 16.5%, on a seasonally adjusted basis in the week ending Nov. 12, according to the Mortgage Bankers Association's weekly application survey. "Rates increased sharply last week due to stronger economic data and lingering uncertainty regarding the structure and impact of the Fed's QE2 program," said Michael Fratantoni, MBA vice president of research and economics, in a statement. Consumer prices rose 0.2% in October, coming in slightly below the 0.3% uptick that economists had been expecting and increasing slightly from September's growth of 0.1%. The core rate, which excludes volatile food and energy prices, was unchanged after remaining flat in September. Economists had been anticipating growth of 0.1%, according to Briefing.com. Housing starts fell 11.7% to 519,000 in October from September's level of 588,000. The market had been projecting a dip to 600,000 from September's initially-reported level of 610,000. 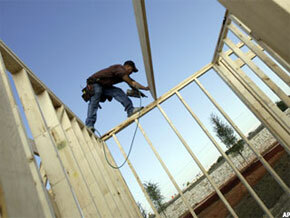 Building permits, meanwhile, inched 0.5% higher to 550,000, from 547,000, previously. According to Briefing.com, permits were expected to rise to 570,000 from September's initially-reported level of 539,000. At 10:30 a.m., the Energy Information Administration will release its weekly read on energy inventories for the week ended Nov. 12. According to a Platts poll, analysts are anticipating a build of 1.2 million barrels to crude oil inventories, a decline of 650,000 barrels in gasoline supplies and a 1.8 million-barrel drop in distillate supplies. Late Tuesday, the American Petroleum Institute said crude oil inventories shed 7.65 million barrels last week. In commodity markets, the most actively traded December crude oil contract was down by 21 cents to trade at $82.13 a barrel. The December gold contract was up by $4.10 to $1,342.50 an ounce. Target's ( TGT stock was up 1.7% to $54.70 ahead of Wednesday's opening bell after the retailer topped profit expectations with third-quarter earnings of 74 cents a share on sales of $15.2 billion. Consensus estimates called for a profit of 68 cents a share on sales of $15.6 billion. Shares of GlaxoSmithKline ( GSK were up 2.1% to $39.35 after its partner, Human Genome Sciences ( HGSI, received votes in favor of its proposed lupus treatment from the Food and Drug Administration. Human Genome's stock was up by 2.9% to $26.64. GM confirmed it's raising the size of its initial public offering by 31% to 478 million common shares from 364 million common shares, previously. Ford's ( F stock, meanwhile, was up 1.2% to $16.70 in premarket trading. The dollar traded higher against a basket of currencies, with the dollar index up by 0.02%, and the benchmark 10-year Treasury note declined 1/32, lifting the yield to 2.844%.